This month my stash bee queen asked for a really fast and fun block that she calls QST Candy Chains (click on the link to see her great tutorial). She gave a wide choice in block colors, and since she had already made an orange and pink block you know I headed straight for my blue fabric bin. 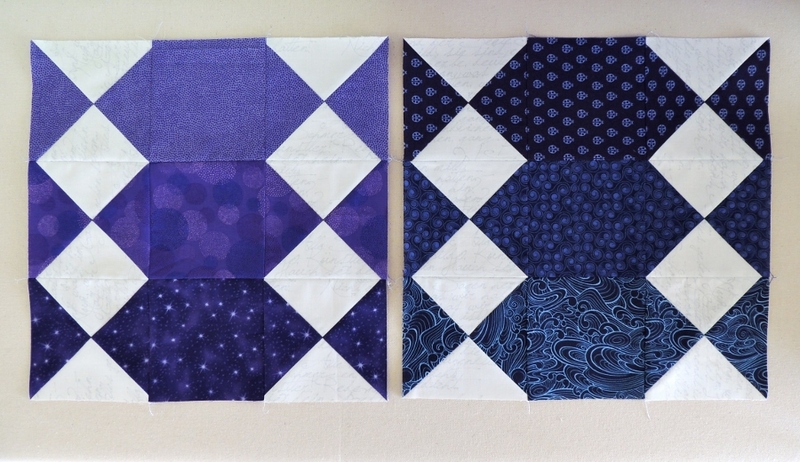 The piecing went so fast that I went ahead and made a purple block to send, too. The blocks are in the mail and another month is complete. Only 2 more months to go in the bee year which is rather hard to believe (the Stash Bee runs January through November)! If you are interested in joining the Stash Bee in 2017, details on how to sign up will be coming in the next few months. The bee will be lead next year by my friend Diana @Red Delicious Life, and I have enjoyed participating as a member and now hive queen for the past 2 years. I will be sure to post more details about next year’s signups as they become available, but there will likely be an update in October followed by sign ups opening in November. Your blocks so far have been fab. I have been wanting to join a bee so thank you for the updates. I look forward to being able to join in when sign ups are open. I usually stumble upon these a month too late to participate. Your blue and purple blocks will look fantastic with her orange and pinks ones. I think this block would be fun to use in making a baby quilt, with lots of bright colors. These look so awesome and I can’t wait to see the finished quilt! Those candies are cute! What a great use of the hourglass block. Cute hourblock variation block. I like the way they look when the different colors are placed next to each other. Diana is in charge next year? Fascinating! I am sure she will do a great job. I thought this was a cool looking block when I saw Allison post in on the Stash Bee blog. I love the secondary pattern it’s going to make and can’t wait to see the finished project. I’ll definitely be posting something about next year’s Stash Bee in the next 3 weeks or so. I missed a photo of these blocks as a quilt. Can you please post a link to a photo of at least a few blocks together? Thanks this block intrigues me….